Hotline Miami became a game barely anyone knew about at a European gaming convention Rezzed to an indie sensation that people fell in love with. The original 2012 title was basically a murder simulator that made you feel bad for your actions. Set in an alternative 1989, you play as the unnamed masked man in a letterman jacket who answers phone calls instructing you to go seek out mobsters to kill. With a sequel on the way, Sony has quickly pounced on the opportunity to port the original to the PS3 and Vita. It began with tentative early talks and now here we are, with the PS3 and Vita version. But does it play well on Sony’s handheld? You begin every mission with a phone call. After answering, you’ll go to your destination and have to clear out all the enemies. It’s brutal in its murder with everyone taking one-hit kills from yourself to enemies, so make sure to go in with stealth but have your fingers on the trigger ready to pull. Death is fast and fervent, so you’ll be pressing X to Restart a lot. Fortunately, this isn’t meant to frustrate but like Super Meat Boy, it’s meant to give you the thrill of the perfect run; to kill everyone with blood on your animal mask. You can either do it in seconds flat or stealtfully hunt your prey. The original PC version had really well-done mouse and keyboard controls. For the Vita, controller-based fans should be happy here. Dual analog has your character moving just as fast as he should be. The triggers are your all-important attack and throw buttons with the X button as your finisher. New to the game is a very great use of the touch screen. You’ll be tapping on enemies to lock-on so you can instantly move on your prey with your knife or your shotgun. It works intuitively and doesn’t ever become tedious. You can also scroll around areas with your fingers to survey the place for enemies. Dennaton didn’t actually develop this version but Abstraction Games made a great port, much like Curve did with Thomas Was Alone. While it may not be a big deal to port a small indie title, Abstraction proved it’s a developer to trust with your indie title. I’m not sure how Sony keeps getting these great studios to port indie favorites but let them keep at it. It’s also one of the best platforms to play the game. The instant restarts that you’ll be doing with one-hit kills make it perfect on the go. You’ll go through a level and if you die a couple times, it’s easy to pick up and play while you’re traveling. They’ve even managed to make the game more arcade-like with the addition of leaderboards. This is super important since while the original did take your score, it didn’t do much then just tell you how well you did. But now, you’re able to compare with your friends or globally around the world. Finally, you can see how your murdering skills do against everyone else. One of the most intriguing parts of the title was always the story. As it develops over time, you start to realize the repercussions of your actions. Halfway through, the pieces fall into place and you begin to ask questions. Who is making the phone calls? Why are these masked men talking to me? Some other new things in the Vita version will include little newspaper clippings around your place to offer context for some missions. It’s not often but it’s quite neat and totally adds a bit to the experience. There’s also one remixed track from the original that sounds great with slightly new instrumentation and vocals. Abstraction made a new mask and it doesn’t really change the gameplay but it’s a really neat visual effect. You’ll find Russell earlier in the game and this mask paints the entire world in black & white except for the blood and the neon pink. It’s basically the only four colors you need for the game and it’s awesome, giving the game a noir-feel. It’s hard to think of negatives because the ones I had previously with the original version have been remedied. The controller or the Vita make the game perfect, there’s no slowdown or any glitches from when it originally launched. But if I had to think of one, there’s not a ton of new material to make you want to play it again if you tried it when it first launched on the PC. 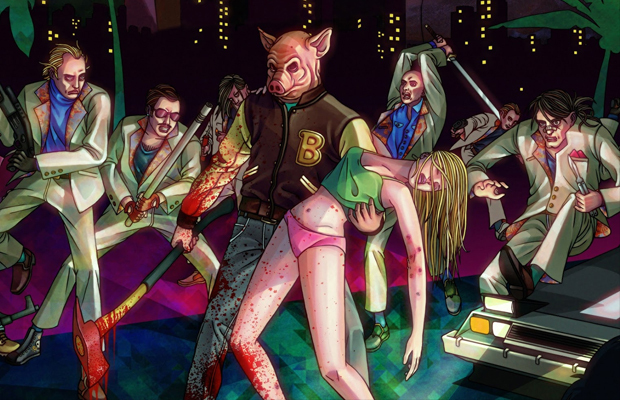 Overall, if you’ve never played Hotline Miami, stop reading this review and go pick it up now. You’ll thank me for the bloodshed and quickly realize how fun it is. The PS3/Vita version is great and the cross-buy and cross-save functionality makes it perfect for any Sony fan. It’s amazing on the go and over time, will become a score achiever’s favorite type of game. Dennaton even said the sequel could come to Vita and Abstraction would be the best way to bring this title over. Just answer the phone, your Vita’s waiting.